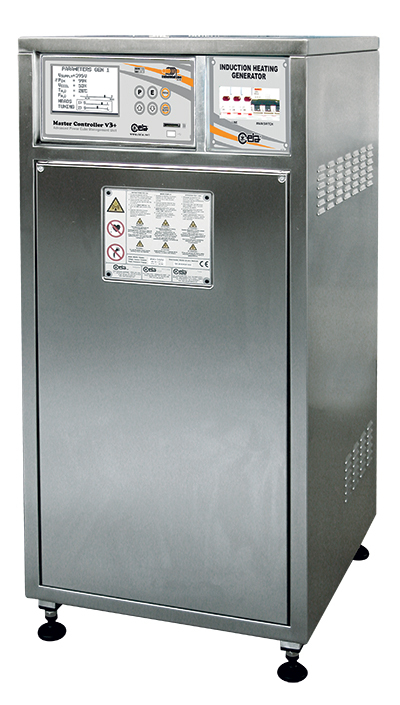 The 50 series is the State-of-the-Art in Medium Frequency Generators available in the market. This family combine the miniaturized CEIA Heating Head solution (patented) with a powerful, continuous-duty rated generator with so high efficiency that it can replace traditional generators in applications up to double input power, thus cutting the initial investment and operating costs. All the devices are solid-state technology manufactured and they are characterized by extremely compact dimensions; an embedded microprocessor, besides to carry out a complete monitoring on the operating status of the devices and to give information on possible technical failures, guarantees the stabilization of the power output and the optimum operating frequency. The use of innovative technology and latest-generation components places the 50 series generators in a class of their own in terms of performance, power output and operational cost.